How can one improve the quality of life in present-day nations? 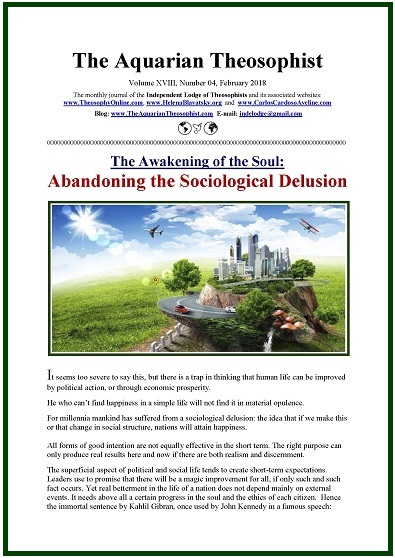 The awakening of the soul stimulates discernment, and the opening text in this edition is “Abandoning the Sociological Delusion” (pp. 1-2). After that, a short letter from a master of the wisdom examines the need to be sincere and work for the essential good of one’s country. On page three, a fragment from Max Picard is entitled “The Heaven of Languages”: “In the Fables of the Golden Age we are told that men understood the language of all animals…”. The note “The Endless and the Limited” is on page four. On pages 5-6, we have an article “On Building Our Jacob’s Ladder – The Vertical Side of a Pilgrimage”. The note “Attaining Freedom From Slavery to Small Things” is on page seven. * Being Friends with Our Subconscious. The 17-pp. edition includes hyperlinks to various articles and a List of the New Items recently published in our associated websites.